I was working on the recent, Enhance your profile feature, and while entering the tags which interest me, I noticed a front-end issue, which I think can be shown different. Currently, the textbox supports a type ahead search for the tag listings, but we have multiple tags that start with the same name, and the width of the suggestion frame stays same as the width of the textbox, which makes selecting a specific tag difficult and a lengthy process. For instance, as shown in the screenshot below, I tried to add Spark, but due to the width, it can't be spotted easily, and I have to read through the descriptions of each of the tag to identify what tag I am looking for. 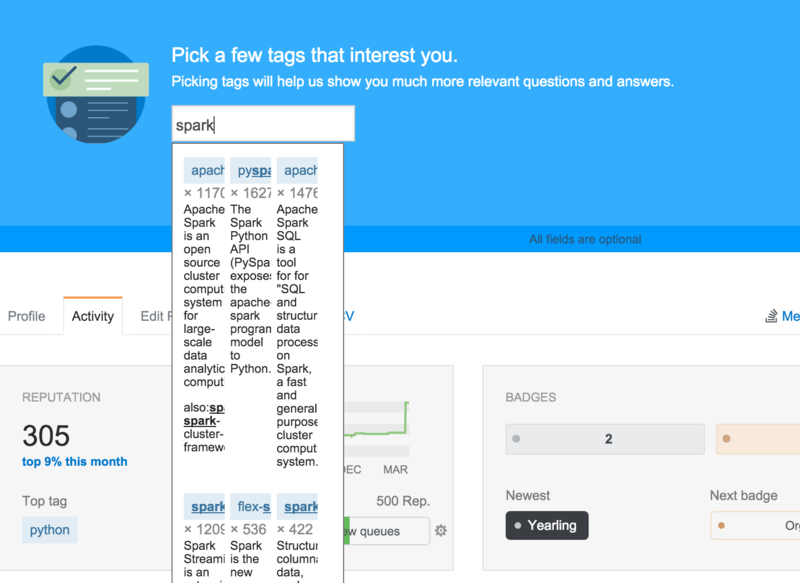 I think that this is an issue, because, while posting a question on StackOverflow, the tag suggestions are legibly and beautifully shown. Please remove the bug tag, and replace it with some other if you think otherwise. I've change the width of the tag suggestions popup to be saner, so this will look better after the next build (rev 2016.3.31.3411, meta rev 2016.3.31.4336).